The US and EU have decided to imposed “deeper sanctions” against Russia if there are “further incursions into Ukraine”. President Barack Obama said “energy is obviously a central focus of our efforts”, acknowledging it “will have some impact on the global economy”. 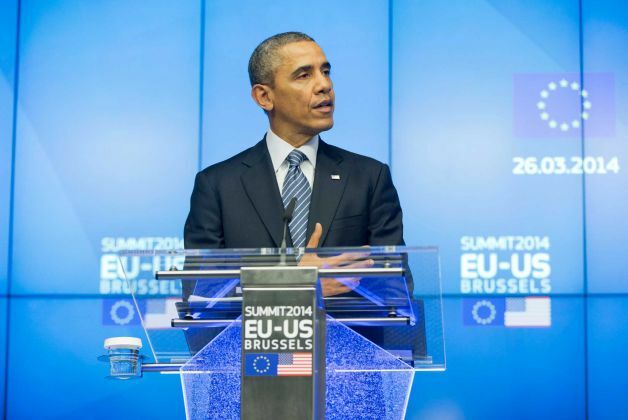 Barack Obama was speaking after talks in Brussels with EU leaders Jose Manuel Barroso and Herman Van Rompuy. At a news conference the three men spoke of the special relationship between the transatlantic partners. Herman Van Rompuy, European Council president, called it a “crucial” relationship. Their talks at the headquarters of the 28-nation EU bloc also covered plans to finalize a transatlantic trade partnership, as well as efforts to tackle Iran’s nuclear program and Syria’s chemical weapons. Barack Obama praised the EU for the steps it had already taken – along with the US – to penalize Russia. These have included visa bans and asset freezes against a number of Russian officials. He said those actions were taken after Russian forces moved in to annex Crimea, and they now must consider “the potential for additional, deeper sanctions” should Moscow attempt to do the same in other parts of Ukraine. “We recognize that in order for Russia to feel the impact of these sanctions, it will have some impact on the global economy as well as on all the countries represented here today,” Barack Obama said. Acknowledging that some EU countries are more dependent than others on Russia for energy, he said “this entire event has pointed to the need for Europe to look at how it can further diversify its energy sources”. Barack Obama said NATO must remain a “regular presence” in those eastern European countries who are now feeling vulnerable to possible Russian intervention. He also voiced concern at the falling defense budgets of some countries. Herman Van Rompuy called Russia’s actions in Crimea “a disgrace in the 21st century, and we will not recognize it”. Ukraine’s southern peninsula of Crimea was annexed by Russia earlier this month after a referendum which Kiev and the West considered illegal. It follows the ousting of Ukraine’s pro-Russian President Viktor Yanukovych at the end of February following months of bloody protests over his decision to seek greater ties with Moscow rather than the EU. Tensions between Russia and Ukraine remain high. Moscow accused Ukrainian officials on Wednesday of preventing Russian commercial pilots and crew from disembarking at Kiev International Airport. This is Barack Obama’s first official visit to the EU headquarters in Brussels. He began his trip to Belgium with a visit to a cemetery in Flanders, where US soldiers killed in World War One are buried. He paid tribute to fallen US soldiers at the American Cemetery and Memorial in Waregem, to mark 100 years since the start of WW1. Belgian King Philippe and Prime Minister Elio di Rupo were also in attendance. Following his talks with Herman Van Rompuy and EU Commission President Jose Manuel Barroso, Barack Obama will meet NATO Secretary-General Anders Fogh Rasmussen.